The Pavillon de la Plage, in the heart of the seaside resort of Trébeurden, offers 20 spacious and bright rooms. Facing the sea, the Pavillon de la Plage offers elegance in a natural setting. The materials are sober and noble, the colours soft and warm, offering guests an ambiance of total relaxation. Elegantly and uniquely refined in a contemporary seaside spirit, the 20 rooms are all personalised. Each room and suite is inspired by the view it offers to the guests: Presqu’île du Castel, île Milliau, île Molène, Pointe de Lan Kerellec, Pointe de Bihit. The materials and furniture used to decorate each room have been selected for their perfect harmony with the refined style of the hotel. All rooms have a sea view. For the comfort of guests, seven of the hotel rooms are equipped with 180 cm beds which can be split to make twin 90 cm beds. 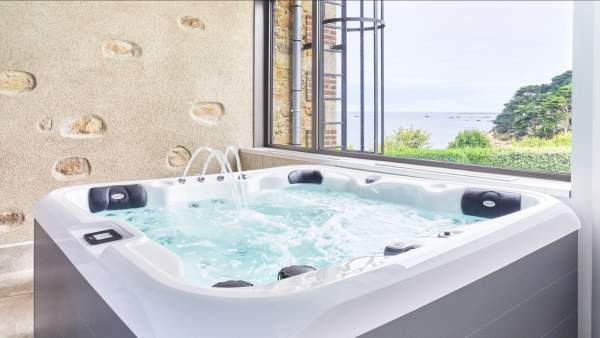 Come and stay by the sea on Brittany's famous Pink Granite Coast, as a family, a couple or for business..
A special moment of the day, breakfast is served as a buffet with a selection of sweet and savoury fresh, local and artisan products, on the ground floor of the hotel in its large dining room. *best rate guaranteed according to period.